This is our third and final part of the blog on occupancy sensors, and as discussed in part 1 and 2 there’s a lot for buyers to consider when trying to make an informed purchase. Two questions we hear are, “how do I sort through the various sensor technologies and know which ones are best for my business?” The first step in solving this conundrum is for decision makers to define and prioritize their use cases and get a better sense of what types of sensor technologies match their needs. But what else do you need to consider in your sensor selection? We break it down here. The first step is to consider what existing systems can be leveraged. Sometimes, an existing building system—like a connected lighting system—can provide sufficient occupancy data to meet your desired use case. The trade-off is that while you may not get the specific type of data you want (i.e. people count), you are able to use this occupancy data with no additional investment. Similarly, it is important to assess whether you are planning to deploy sensors during a new office renovation or significant retrofit, or while the building is in use. Where you are in the project lifecycle can both create new opportunities or present limitations. For instance, as part of a retrofit you might choose to install a system as Power over Ethernet (PoE) instead of battery, which has implications for latency and operating costs depending on the technology (more on that later). The best way to identify a sensor vendor that will meet your specific needs is to first understand how you and your organization evaluate three key things: data granularity and frequency, total cost of ownership (TCO), and privacy. Let’s dig into the key considerations for each. When evaluating a sensor solution, you’ll need to consider the data specificity that is required for your scenario. Given your desired use case, access to a specific data type—such as people count, “gross” utilization (e.g. low, medium, high use), and yes/no occupancy—will influence your sensor selection. For example, wanting to know the number of people in the cafeteria to estimate live wait times or plan future cleaning schedules requires a sensor with advanced people counting capability and the ability to communicate in real time. 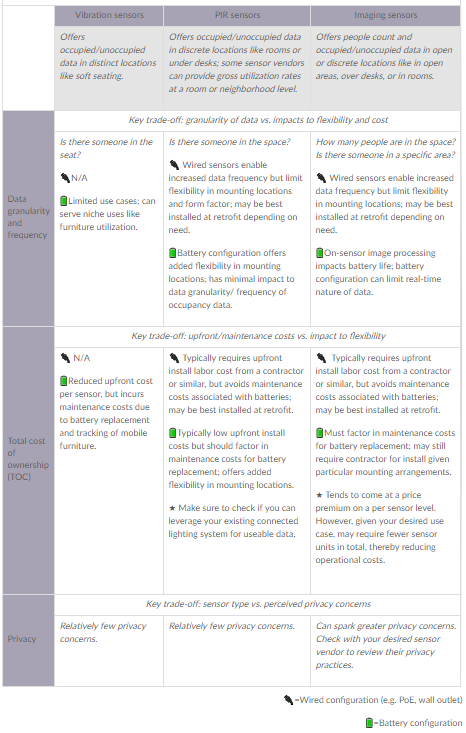 The configuration of your system also impacts the useability of your data; choosing a wired vs. battery-powered system can impact performance (see table below). When evaluating sensors, it is critical to weigh both upfront costs and costs of ongoing maintenance. A holistic assessment should include costs for hardware, installation labor, replacement parts (like batteries), and maintenance labor, and decision criteria should recognize the trade-offs between these costs and different sensor types. For example, while some of our customers prefer the flexibility and ease of deployment that battery-powered sensors provide, others are wary of the accompanying maintenance costs. The ultimate value that occupancy sensors can bring your organization, immediately and in the long-term, is actionable data. Unlike historical utilization trends, real-time data allows you to put sensor feedback to immediate use, through employee-facing tools that provide a better overall employee experience and more automated space optimization. This data can also help you get insightful utilization trends to inform strategic space planning. We are keeping an eye on the evolving world of occupancy sensors and the value that they deliver to real estate teams looking to make more informed decisions about space and workplace utilization.